The Un-Official Blog of Romance Author Maddie James: A Pan is a Pan is a Pan? 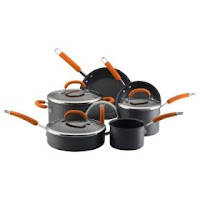 I don't have a fancy set of cookware... although I covet this one. Maybe someday, when I have the extra dollars, and when something else isn't taking precedence, I'll splurge and buy it. It's kind of like, for years, I coveted a Kitchenaid mixer. I'd used a hand mixer forever and still, I think there are times a hand mixer is better. But finally, I broke down one day and bought a Sunbeam. Now, I know it isn't a Kitchenaid but this one was extremely reasonably priced and I love the Sunbeam. I thought at the time that perhaps it would be my transition mixer until I bought the happily-ever-after mixer. Not so, I think. This baby works fine and dandy and I love it. I doubt I'll wear it out in my lifetime! And I'm happy! Ever. After. But I was going to talk about pans, right? Yes. I have a mish mash of pots and pans. They've lasted, they've been loyal, they know their jobs. How can I let them go for a new shiny set? Not yet. We're doing just fine on our own. 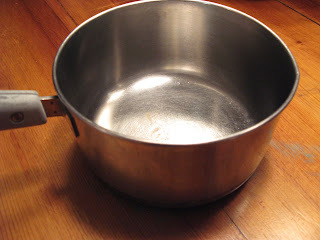 It's an old Revereware saucepan. It was part of my mother's set. For some reason at the last minute, she gave it to me when I went away to college. She said, "You never know when you'll need a pan." That was 1975. I still have it. I'm not sure how it got bent but it's still great for heating soup. Then there is this little number. 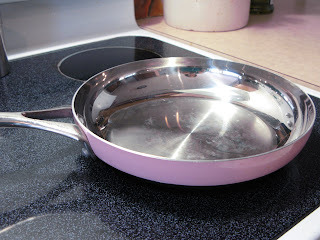 The preferred egg pan. The PERFECT egg pan. I cook nothing else in this pan but my one (sometimes two when I'm splurging) morning eggs. I have several "skillets" I use for various purposes. One is not good for much of anything besides grilled cheese. It doesn't heat evenly all the way around but the center is wonderful for browning a nice grilled sandwich. But just one. If you want to make two, forget this pan. The there is the Farberware soup pot that came with the set my grandmother gave me for my first wedding. It has one handle off but hey, it's mine, and I still love it. Imperfections never bother me! I'm not sure what happened to the rest of the set. I do have a small saucepan but who knows where its sisters ended up. How DO we lose things like that over time? But the creme de la creme is my new favorite pan. I call her Pink Bling. See? I found her on the center sale aisle at Macy's. She was a good price and she was PINK. Now, I'm not a pink girl. I'm more of a blue or green or even black girl when it comes to colors. So, I hesitated, but the price was good. It was a nice size, cooking for one most of the time. So, I bought her. Wow. She cooks like a dream. Cleans up like a dream. Looks like a dream. I'm in love. So, what about you? Is a pan is a pan is a pan? Do you have a fancy set and if so, what would you recommend? (just in case I decide to splurge?) Or do you have and prefer a mishmash like mine? Although I'm just a cook, and not A COOK like you, I do use certain pots/pans/skillets for particular jobs, every time. 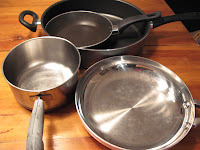 I've had most of my cookware for more than twenty years. Some of it was inherited, and is probably older than I am, like the cast iron skillets and corn stick pans. Should I mention that I have a KitchenAid mixer? Hm...no, probably not. I've gone through numerous sets over the years. I've had Farberware, off brands. I used to swear by T-Fal, but when the teflon starts flaking off, I get leary. I don't want to eat those flakes and I definitely don't want to feed it to my kids or hubby. One year for Christmas, my husband got me a set of Tramotina and it was pretty, red- BUT- none of them cooked well at all..everything stuck to them and it was really aggravating..and the coating peeled off a lot sooner than T-Fal, even when using only plastic cooking utensils. Right now my favorites are my set of Regal. They cook great, clean up well. 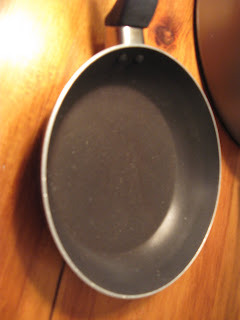 I have two of those small skillets that I used for frying eggs, too and I just love them. They're the perfect size for them. My only issues with it are the bit of "warping" that happens when the skillet heats up and that it's a bit wider than the typical skillet that comes in a set. You know how the lid for the dutch oven usually pulls double duty and fits the skillet, too? Well, the lid fits IN the skillet with this set. The warping part happened to the center of the bottom- it bowes out almost like a bubble and when you use it on a glass/ceramic stove top, it wobbles around and doesn't cook exactly even. But then, I'm still getting used to that flat top stove after having used one with coil burners for so, so long! LOL I used to know exactly what temp to turn the knob to, now it's a guessing game...sometimes a 2 is a 2 but other times its more like the burner's not even on, or it heats up like a 6 and vice versa. Oh, I know what you mean about warping! I think that is what happened to the grilled cheese pan. I'm glad I'm not the only one to hodge podge!